While Microsoft has already surrendered in the browser world and decided to move Edge to the Chromium engine, it doesn’t mean that this application doesn’t come with advanced features that are worth copying. And by the looks of things, Google totally agrees with this, as the company is getting ready to borrow another idea from rival browsers. 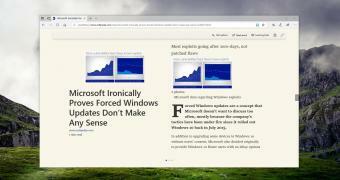 This time, it’s a reading mode that’s already available in Microsoft Edge, Mozilla Firefox, and even Vivaldi, and Google apparently wants this feature to be part of an upcoming stable release of Chrome too. Details at this point are scarce, but a recent bug report indicates that the reading mode is supposed to work on all platforms where Google Chrome is available, including Windows, Linux, and macOS.